I do believe this was once known as Hollowbread’s ale house. This is the old Prince of Wales in Wash Rd and I suggest it dates pre WWI as the roof and chimney are in a good state of repair and there is no window to the saloon bar which is evident in later photographs. This photo was probably taken circa 1930 and the state of the roof and chimney have badly deteriorated from the previous photo. The person standing in the left of the doorway (facing) was Charles Franklin and the person on the right was Jack Franklin who had a butchery shop in Wickford High St. Charles had a daughter who often called Hessie and who maried Tom Webster jnr., and two of her children can be seen in the photographs of Wilson’s the chemist. It was only a few years after this photo that work began on the new Prince of Wales in 1934 and opened in 1936 with Charles as the licensee but he did not remain there for very long and retired to his bungalow “Petcheys” located between the new POW and Madew Nurseries of his daughter and son in law. This is the new Prince of Wales opened in 1936 and the bungalow of the Charles Franklin can be seen in the background. I would suggest that given the state of the road, this was taken after WW2. It had several licensees and I believe the most well known to have been Lionel Hyatt who has been featured in other pages of the website. A futher pesonal memory in respect of the Prince of Wales dates from 1934 when it was being built. Myself and my friend, Ken Ripper, used to play cricket in the Buckenham’s meadow opposite after the cows had gone in for milking. We had a bat made from a piece of floorboarding with cloth wrapped around the handle. One afternoon, the General Foreman from the POW, a Mr Fred Wainwright, whom we later found out was connected with Hutton CC, came across the road and gave us a real cricket bat, youth size. Christmas came early that year. Sadly Peter “Tubby” Hyatt is no longer with us. I heard this sad news from a fellow biker and “Old Laindoner” Brian Cordell. 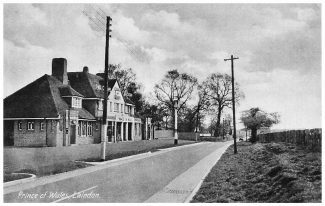 J.B.
Reading about the former Laindon Pubs that no longer exist, I wonder if the readers remember the “Cricketers” along the A127 at Nevendon, sadly another landmark that has gone the way of the Laindon pubs. I recall as a child catching a bus with my father, from the “Fortune” to the “Cricketers” I was treated to a “penny arrow root” biscuit and a glass of lemonade and waited outside untill my Dad re-appeared. How times have changed, children allowed inside now! (Youngsters even standing at the bar while parents are served). I recall Mr. Hyatt’s son, Peter, whom I went to school with at LHR. I agree that to Laindon people it will always be the POW. (The Noak Bridge community is aptly named “Toy Town”) The “Crown” will also be forever remembered as the “Crown” The last hill before you came to the “Crown” was, and still is Crown Hill! Or is it now called “The Harvester Hill”? If it was a Saturday in the footie season, then watch “Spud Murphy” playing for the Laindon eleven! Watching a game on a freezing cold Saturday afternoon with my Dad in a snowstorm in March, we then walked home to watch the boat race on our tiny b/w TV, that my Dad bought specially to watch the Coronation in 1953. Happy far off days of a Laindon gone by! Sigh! I have just been reading the comments on this page and feel I must correct Mr Diment, Alan Davies is my cousin and I am one of the girls who lived In the house called Agra with my parents Mr and Mrs Davies. I am the youngest in the family of eight girls and two boys, this was our family home where I and several of my siblings were born and we didn’t house any juvenile offenders, our family was large but well behaved. They did however look after two young ladies during the war, as their family home had suffered bomb damage and their mother was in hospital. Agra was quite a large house and it was in Pretoria Avenue which was off Kimberly Road. I am sure it was the only house with this name. The house was compulsory purchased by Basildon Corporation when I was about 19 when we moved to Basildon. I have been away from Laindon for some 40 years but still have family living there, I don’t recall Mr Diment at all, but lots of other names I do remember so I enjoy reading the stories very much. How sad all the names have changed. Remember the Prince of Wales but not as well as the Fortune of War. Remember going there during the break at the Youth Club Dance held on Friday nights at the High Road School. I had my first gin and orange (yuk) there with Terry Reynolds, Mick Gleeson, Mary Baker and several others. Probably where I started smoking as well, although I kicked the habit some 12 years ago now. I have spent the last 3 hours remembering my wonderful youth with the help of photos and other people’s memories. They were such wonderful days. Further to Alan Davies comment of 23/08/13 and the house called ‘Agra’. There was a large house just to the east of the chapel which I believe may be the house in question. If so, in later years it still housed a number of young people who were juvenile offenders and sent there by the local authorities, but I do not know if it was managed by Mr and Mrs Davies. I believe that the man who managed this had strong connections with the chapel and would collect children to attend Sunday School. Perhaps Bill Diment or Rob Merrison, both familiar with Wash Road, remember a large house called Agra? It housed my uncle and aunt, Albert and Ginny Davies and a host of children. I am still in regular contact with one of their sons, my cousin Ron, who married Sheila Larkin. The Larkin family lived a hundred yards up St Nicholas Lane from the Hiawatha as the road jogged left between Douglas Road and Tattersall(?) Road. Ron and Sheila live in Rayleigh and have visited us several times in Savannah, Georgia and plan to again now we have moved to San Diego, California. Further to the comment of Rob Merrison, 19/08/2013. Is he by any chance related to Albert Merrison who also lived only a few doors way from the P.O.W. in Wash Rd. and with whom I played cricket for Laindon CC. Bert has written to the archives on several occasions although now resident in the midlands. Concerning the comment on 1.3.2013 by W.H.Diment: my grandparents lived in Wash Road not far from The Prince of Wales. Their son Edward was killed in World War II when his boat was torpedoed. His boat was the corvette Fleur de Lys so it sounds that unwittingly they have provide a small memorial to my uncle! Hi, what a terrible shame changing the name of POW my grandfather and all my family drank in POW my mum was barmaid there when Lionel and Frances owned it, its so sad. My poor father must be turning in his grave, my grandfather too as this was their preferred drinking place. They might have put a piece of board up with another name but to true Laindoners it is, and always will be, the Prince of Wales. It would seem that the brewers may have realised that some locals would be less than pleased over the change of name. They have now installed over the front entrance, a large plaque of the Fleur-de-Lys although the new name still remains. I wonder if the brand creators and advertisers who have made money out of the owners by convincing them that the name needed changing, realised the consequences. 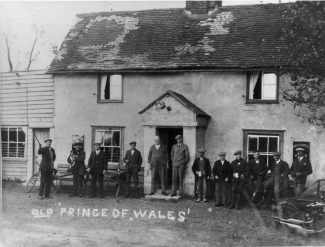 The name “Prince of Wales” has been used for 200 plus years and has served the pub well. The new name is unlikely to change the pub’s turnover and is just a scam for money-making by the promotion company. I also wonder if they realise that locals call the Noak Bridge community that it serves “Toy Town”. Perhaps naming it “The Toy Town” would at least attract the curious. The name is not the attraction of a pub it is the quality of the service, the ambience and if they serve real ales the quality of the beverage. 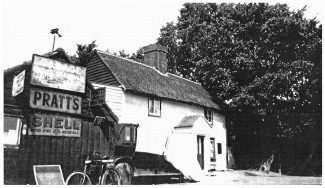 Yet another part of Laindon’s heritage has been consigned to the historical dustbin. The Prince of Wales has now been renamed The Noak Bridge. 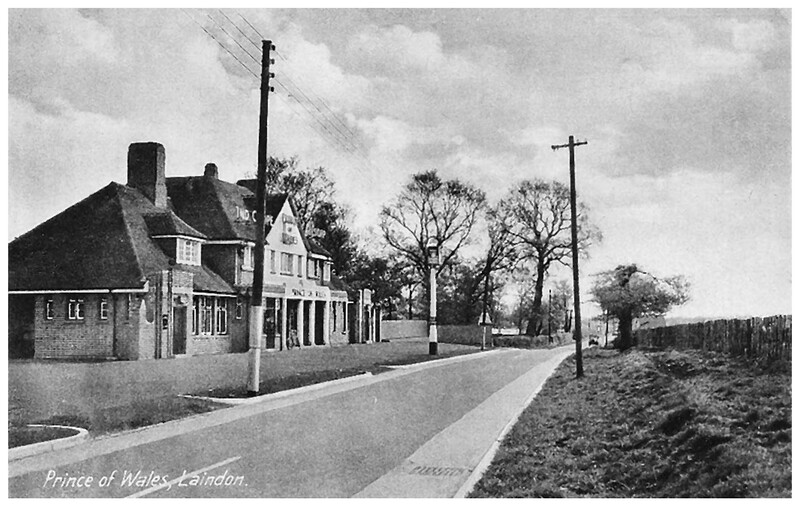 The Laindon Hotel, the Fortune of War and the Prince of Wales no longer exist. Very sad and the Crown Inn at the top of Crown Hill, Langdon Hills was renamed ‘The Harvester’ a few years ago and the gold ‘Crown’ on the front of the pub was taken off and now is apparently ‘lost’. The original names were by far the best.